Loveness Luwanja receives LifeNets Livelihood Development grant for beauty salon in Lilongwe, Malawi. Part of the grant included the construction of a shop. LifeNets volunteer Cindy Harper writes in the December 2009 United News about her and her husband Dan's work in Vinogradov, Ukraine teaching English as a Second Language to orphans and street kids for the past two years. Take a peek at our latest - 4-fold brochure giving an overview of what LifeNets is and does. Another successful LifeNets livelihood project....a Mini Shop in Lilongwe, Malawi that is providing a good living for a family. Read this wonderful report by proprietor Wordsworth Rashid. This is what LifeNets is all about! From Zimbabwe Tshabalala reports on a new LifeNets goat project managed from South Africa. Read short report and be looking for more photos to come. Once again, a beautiful Charity Tea was held in Piscataway, New Jersey on an ideally beautiful day June 28, 2009. The chief organizer was Dr. Barbara Walls who again put forth a phenomenal effort to raise attention and money for disadvantaged children in Balaka, Malawi where LifeNets operates the LifeNets Orphan Care Centre. LOTS MORE! Wonder where some of the items you give LifeNets end up? Read about this wonderful shipment to Malawi of eyeglasses, white shirts, toys, blankets and more. LifeNets repairs wheelchair and provides mobility for woman whose chair was damaged by car. She waited four years! Small job, bit impact. Read story and see photos. New LifeNets North Dakota Web site! Announcing the 2009 Triathlon--it's different this year and you can be part of it no matter where you live. See Ralph and Pam June 22, 2009 interview on KFYR Bismarck TV along with video clip. LifeNets volunteer Gerald Hoyer helps deliver LifeNets wheelchair to recipient in Mesa, Arizona on May 31. See more here. The story of the LifeNets Izabal Project on the Atlantic side of Guatemala. Jon and Barbara Brightman from Chicago helped many children with shoes, school supplies and school fees. LifeNets helps large family with extreme makeover of their home. We thank donors, participants who helped! MORE. What Do LifeNets Projects Cost? See our latest (March 18, 2009) chart. Soundpost band performed at the Ft. Worth, TX Boot Scoot Fundraiser on January 10th for the LifeNets Developing Nations Scholarship Fund was a great success. More than 100 attended and about $5000 was raised. This will send three young adults to college for one full year in Malawi or Zambia. See report and photos. Christina Davis is spending two months in Malawi starting January 15, 2009 and will be living and working in Malawi as part of the International Development Internship Program at Seattle University in collaboration with LifeNets. Her research agenda. Updated on the story of paraplegic, Ivan Sobolev in Chernihev, Ukraine. MORE. LifeNets co-sponsors Memorial Concert for Alcohol victims in Estonia on October 10, 2008. We have been helping Ole Kaine (OK) meaning "Be Sober" for the past five years. MORE. LifeNets Zambia Director Kambani Banda with his wife Shirley. He gives another interesting report about LifeNets activities. LifeNets sent Jennifer Myers this past summer to Malawi and Zambia to teach a "Business 101" seminar and to assess many of our livelihood development projects in those countries. She was a joy and inspiration to our people in those countries. Read her report and see a LOT OF PICTURES! At age two Matilda weighted as much as a newborn when she came to the LifeNets Orphan Care Centre. This is her photo in September 2008. She is alive and thriving. Please read about her and the LifeNets Orphan Care Centre in Balaka, Malawi. UPDATED Whittier Alternative School in Sedalia, Missouri collected blankets and toys for LifeNets earlier this year. All the items have now arrived in Malawi and have been greatly appreciated by the LifeNets Orphan Care Centre in Balaka. Real Simplemagazine, circulation 2,000,000, mentions LifeNets as a good place to go to to recycle your wheelchair. See Web version. Real Simple is a monthly women's interest magazine published by Time Inc. features articles and information related to homekeeping, childcare, cooking and emotional wellbeing. Real Simple is distinguished by its clean, uncluttered style of layout and photos. Real Simple made its television debut in 2006, with a half-hour segment airing on the Public Broadcasting Service (PBS). Whittier Alternative School in Sedalia, Missouri collected blankets and toys for LifeNets earlier this year. All the items have now arrived in Malawi and have been greatly appreciated by the LifeNets Orphan Care Centre in Balaka. Summer 2008 LifeNets project in Vinogradov Ukraine from June 16-27 to teach children English and help with summer camp. Read the impressions of our volunteers and see their terrific photos that tell a wonderful story! We will feature the final report from Dan and Cindy Harper shortly. LifeNets Girls Scholarship Program co-chairs Rose McDowell & Judy Servidio report on their miracle trip to Kenya! A special thanks to those who contributed funds for the scholarship program and for the women’s project. READ INSPIRING REPORT! Summer 2008 LifeNets project in Vinogradov Ukraine from June 16-27 to teach children English and help with summer camp. Volunteer Ken Zahora from Lafayette, Indiana with Diana and Vasyl. Read his impressions and thoughts and see his terrific photos that tell a wonderful story! This is the first of several reports from our volunteers that also included Dan and Cindy Harper from Cherbourg, France and Stefan Saxin from Gothenburg, Sweden. Updates to our SCHOLARSHIP section. Helping former orphan Godfrey with his studies at School of Mines in Zimbabwe. Read about some of LifeNets work in Zimbabwe. A wonderful LifeNets Ladies Charity Tea on June 22, 2008. It was well-attended and provided funding for almost an entire year for the LifeNets Orphan Care Centre in Balaka, Malawi. More story and photos. LifeNets 2007 Annual Report including Financial Summary was mailed to friends, donors and volunteers on June 5, 2008. You can also see it online at www.lifenets.org/newsletter. Earth Day program at Park Tudor School in Indianapolis about LifeNets water wells in Malawi given by Cathy McClure and Victor Kubik on Friday, April 25, 2008. Joseph Eldridge Charities Coordinator for the Central Indiana Better Business Bureau and Victor Kubik make presentation about nonprofit assessment program at first annual Nonprofit solutions conference at IUPUI on April 16. What do LifeNets Projects cost? See our latest chart for selected projects. Ivan Sobolev of Chernihev, Ukraine was paralyzed for life on July 17, 2001 at the age of 20. Read his inspiring account about how he has battled this great disability. LifeNets has been helping him since 2002. NEW LifeNets Online Newsletter starts -- would you like to subscribe?? Speech by LifeNets North Dakota Chapter President Pam Redline to the UCG Family Club in Bismarck/Mandan, North Dakota. Reminiscing, updating and closing words on our Manhattan Project to help 911 Victims in New York City in 2001. New LifeLines newsletter mailed December 1, 2007. See it online. Wendy Jacobs, from Seattle, Washington on Operation Smile mission in Morocco. LifeNets helped sponsor her trip. See more photos and story about the mission. November 1, 2007 update on LifeNets computer school program in Western Ukraine for youngsters. LifeNets helps with outdoor cooking stove project with Rotary. Indiana student supervises the building of 20 of these stoves for impoverished families in Honduras. Phil Myers who along with Aaron Blue and Jennifer Myers participated in the LifeNets Malawi Medical Mission in June/July 2007. He completes his wonderful travel blog on October 11th. You may want to read his last entries. LifeNets helps sponsor teen alcohol abuse program in Estonia called OK which stands for "Ole Kaine" or "Be Sober." Read about latest media campaign and report from program director Lauri Beekman and the opneing of alcohol and smoke free coffee shop. Lauri is a Sabbath-keeper and has been helpful to United Church of God work in Estonia. Read September 22, 2007 update. See latest report of LifeNets Southern Africa. Also see the entire LifeNets Southern Africa Web site. Mandan North Dakota Triathlon on August 26 was a great success! See report, photos and video clips! Blankets distributed to orphans at the LifeNets Orphan Care Centre in Balaka, Malawi on June 20, 2007. Read eyewitness reports and see lots of pictures! LifeNets donates Mercedes van converted for 20 passengers in Germany to be driven to Ukraine for Vinogradov Street Children. See more. Portland, Oregon volunteers are organizing fundraiser to benefit LifeNets and Lions. See website www.lunchspecialstoday.com Karen Schuster did May 20, 2007 interview to promote Lunch Specials Today on 1190 KEX radio in Portland. Hear it! (mp3). With the help of Rotary, LifeNets drills borehole in Blantyre, Malawi that provides water for 1500 people. LifeNets contributes to Houston Women's' Enrichment Weekend in January 2007. Hobart, Tasmania, Australia volunteers support LifeNets projects in Zambia and Zimbabwe. Mary Chisevente of rural Mapoko, Zambia receives LifeNets wheelchair delivered by Kambani Banda in January 2007. She has been disabled since age 15, yet continues to work in the fields and walks five miles to church services each week on her crutches. Please read Kambani Banda's inspiring story about Mary. Kim Schuster who attends Portland State University is an active LifeNets volunteer in the Portland, Oregon area. Read more about her and the Nets Save Lives update. Also see more photos from the first Cherry sale project in the Northwest. LifeNets helps farm family in Zimbabwe who live in extreme hardship with purchase of pickup truck for their farm. Thanks to all who help LifeNets help people in ways like this! More. LifeNets continues eyeglass distribution at Mai La Refugee Camp near Maesot, Thailand October 21-24, 2006. Please read this story. 2005 Annual Report now available online in newsletter section. Or go directly to the PDF file. North Dakota LifeNets Triathlon Event was held September 17th. See photos. See the Triathlon website See Photos. Christina Davis of Portland, Oregon raises $5000 in cherry sales for LifeNets "Nets Save Lives" project for Malawi!! An amazing story of a young lady dedicated to a mission that will make a big difference in the lives of vulnerable children in Malawi. Another LifeNets Livelihood Development success story. Family of 10 living in poverty in Peru now now makes a living and has a life. Livelihood Development project in Brazil. LifeNets starts eyeglass distribution at Maela Camp near Maesot, Thailand. First shipment of 200 distributed on June 1-2. Another shipment just arrived July 8th with more being planned. North Dakota LifeNets chapter directors run in 4th of July parade promoting September 17th Triathlon to benefit LifeNets. More LifeNets success stories from Guatemala: Scholarships, Livelihood Development and Habit. See latest report about 2005 outcomes. LifeNets maize mill in Blantyre, Malawi is up and running in March 2006. This livelihood development project is providing a living for three United Church of God families. More. Katrina postscript. The story of Shadow--one of the many many touching stories of the hurricane. Plan now for the 2006 Mandan Triathlon to be held September 17, 2006. See our new website! We visited New Orleans on February 25th. Read our latest Katrina blog about the what's happening along with stories of care, compassion and courage. Albertson's, Osco, Savon join LifeNets to help Christina Davis of Portland, Oregon to provide 1000 mosquito nets for Malawi. Read updated report about how you can painlessly help when shopping at any of these fine drug stores! Kevin and Sonali Fiske report continuing progress of Sri Lanka Reconstruction progress. SEE MORE PHOTOS and REPORT on our latest blog entry. Kevin and Sonali Fiske return home to Orange County on December 18th after a working nearly a year in Sri Lanka on our LifeNets Tsunami reconstruction project. Before leaving they turned over three of the eight homes they built to recipients. We congratulate and salute them for their hard work and sacrifice. Their efforts have restored the lives and livelihoods of more than 60 people in Sri Lanka! SEE MORE PHOTOS and REPORT on our latest blog entry. LifeNets support of orphans and street children goes into its 5th year in Vinogradov, Ukraine. You have helped us transform and change the lives of 32 children! Read the latest update from Vasyl and Irina Polichko who watch for these children. Some NEW LifeNets Wheelchair Project stories. Read about some of the wheelchair matches that have changed people's lives. Wheelchair Project: List of available wheelchairs through LifeNets. More information. Dr. Vasyl Pasechnick Receives Highest Citizen's Award by the President of Ukraine, Victor Yuschenko. LifeNets has worked for almost ten years with Dr. P. in the Chernobyl area of Ukraine. Update on LifeNets Wheelchair Project. We have a drop-off location in the Chicagoland area. Katrina Disaster Relief Check our latest Katrina blog www.lifenets.org/katrina/blog.htm Our attention focuses on the New Orleans and Biloxi aftermath. Thank you for your support. 200 donors gave more than $25,000 for Katrina Disaster relief which is now administered hands-on by our volunteers on the scene. Comprehensive report with photos from LifeNets Zambia director Kambani Banda about our cattle and agricultural support revolving fund. LifeNets East Africa (Kenya, Tanzania and Uganda) chapter information is now online! Please come and visit us. The city of Mandan, North Dakota is holding a TRIATHLON and Mini-Sprint on September 25, 2005 to benefit LifeNets. It will involve hundreds of runners, swimmers and bikers. Read organizer Pam Redline's story! LifeNets begins an initiative in Jordan. We have just returned from a week-long trip. Story and Photos. LifeNets container that left Indianapolis on April 19th, arrives in Chernihev, Ukraine on July 8th. See unloading photos of tons of good stuff! The city of Mandan, North Dakota is holding a TRIATHLON and Mini-Sprint on September 25, 2005 to benefit LifeNets. It will involve hundreds of runners, swimmers and bikers. Visit our new LifeNets blog and bookmark it! LifeNets to help in Sri Lanka with rebuilding fishing industry and giving survivors a new start. Through a special bill signed by President Bush donations made before January 31 to the LifeNets Asian Tsunami Reconstruction Fund arLifeNets installs new boarde tax-deductible on your 2004 taxes. Please read more about our latest initiative. New LifeNets Brazil cattle project. Update on LifeNets section on our operating philosophy and how we got started. LifeNets Orphan Care Center, an adjunct to the Chizeni Clinic feeds and provides medical care for 195 orphans. We have successfully been operating for more than a year. Mobility van provided for Wade Malwitz who has suffered from Multiple Sclerosis for the past 14 years. MORE. Mobility van provided for quadriplegic Martin Brown in Johannesburg, South Africa. The story. See our Annual Report online that was mailed out September 9, 2004. If you haven't received it in the mail, you can order your copy here. Latest newsletter out! See it online in PDF format or ask that one be sent to you. Dr. Vasil Pasichnyk and his wife Dr. Natalia Zenchenko visit Indiana September 5-13 and connect with doctors and rehabilitation centers. See press release. Dr. Pasichnyk was the head pediatrician in the Chernobyl area during the time of the accident and since has established unique center of rehabilitation for children. Check out our Chernobyl section on this site. Jonathan McClure (15), places 10th in a National Competition for National History Day with his senior individual documentary entitled "Nowhere to Hide: A Look At the Chernobyl Disaster." He received the Outstanding State Entry award for the senior division. MORE Also read about his Eagle Scout project that will connect Riley doctors with Chernobyl. See the 10-minute award-winning video by clicking here!! Filipinos from Leyte benefiting from LifeNets Livelihood Development Program by raising goats, opening variety store and making cocoa tablets. Read more. Ambassador Bible Center sponsors LifeNets Charity Evening Sunday, July 13 and raises more than $2100 for the Developing Nations Scholarship Fund helping send more than 40 students to universities in their own countries. See more pictures and story! New LifeNets bi-monthly newsletter is mailed out June 4. See it online...if you haven't received it in the mail, you can order your free copy here. In Guatemala LifeNets continues to improve habitat and support livelihood development in Peten and San Marcos. Read MORE and see more photos. Thanks for helping with these projects! Newest LifeNets Livelihood Development Project augments income for several Filipino families. LifeNets provides loans to buy goats make cocoa tablets and purchase fishing gear. This project is making a difference in people's standard of living. Net proceeds from the 1993 Eurovan on right are being used to provide scholarships for deserving university students in El Salvador. This will help them obtain a profession and a decent and honorable living in a country where the unemployment rate is more than 50%. Be watching for the next project that will continue to help further the education of deserving students. LifeNets mails out Annual Report. If you are not on our mailing list and would like to see some of the many projects that LifeNets has sponsored, ask for your copy by clicking here. Be sure to include your address. First come, first served. Ambassador Bible Center (ABC) Students present Talent Show and Bake Auction to benefit LifeNets Latin America Scholarship Fund on July 14, 2002. $1,158.70 was raised! Photos, story and program click here! UCG Atlanta Young Adults doing annual fundraiser to help Central American students. Check the new Volunteer and Outreach Page that we are just starting showing what some areas of the country are doing for the less fortunate in international areas! Restoring 24 heifers and two bulls to two remote communities in the the Mumbwa region of Zambia and now providing milk protein and draft power in five years. READ THE CURRENT REPORT and see some interesting photos! Clyde Kilough from Sacramento, California volunteers as LifeNets coordinator for Philippines projects. LifeNets launches its 2002 initiative that will including helping Mindanao camp to be held again in April. Natasha Vasilita, Moldovan orphan came to Indianapolis for surgery. This was partly facilitated by LifeNets. She dies unexpectedly. Read her remarkable story. LifeNets names Luis Mundo new LifeNets Director for Guatemala on November 13. He will continue the work projects that we have been conducting for the past two years. Check out our Central America section for more about what we do in Guatemala and El Salvador. LifeNets Manhattan Project November 16 Update. process in New York City. Please read about how YOU can help provide relief directly. We commit to helping street children in Vinogradov, Ukraine by providing a meal and shelter for less than one dollar per day per child. 2000 Annual Report mailed out July 24, 2001 to donors, volunteers and friends. If you would like a copy, please send us email and include mailing address. A summary of LifeNets success stories in Guatemala -- click here! LifeNets is now registered in South Africa as of May 18! Debbie Wesley visits China in April and files this report with photos. Indiana First Lady Judy O'Bannon spent Friday morning March 30 with Lydia Kubik-Bauer and Victor Kubik discussing humanitarian initiatives in Moldova and Africa. Judy O'Bannon is leaving for Moldova on April 16th and will be working with orphanages. LifeNets Rotary Presentation (left)—Victor Kubik, LifeNets president, explains how LifeNets has helped children afflicted by the Chernobyl nuclear disaster to members of the Indianapolis Downtown Rotary Club, Indiana’s largest Rotary Club on March 20th. More than 300 members attended the event at the Indianapolis Athletic Club. Kubik also spoke about about LifeNets at the Northeast Indianapolis Rotary Club on April 4th. (Right) The Zaldana family of El Salvador who live on the side of the Volcano of San Salvador. They all lost their homes in the recent earthquake. They are all wearing clothes from the LifeNets container sent in February. Read the latest update of our working in Guatemala/El Salvador. Also click on the Guatemala button on this page. Priority One: Shipping 40 foot container from Minneapolis, MN to Malawi...final prep -- read story. Construction continues on the new LifeNets Malakia Clinic and Birthing Center in Lilongwe, Malawi. See February 1, 2001 construction photos. Full report on the Clinic. Container to Guatemala leaves Houston, Texas on Friday, February 2nd. Story. LifeNets makes $1500 grant for May youth camp in the Philippines. LifeNets takes shape in Southern Africa. First meeting of Management Team held December 23, 2000. LifeNets announces the Zambia Project. Zambians in the Mumbwas area have lost all their cattle due to Corridor Disease three years ago and live at subsistence level. Read about how we want to turn this around! Construction continues on the new LifeNets Malakia Clinic and Birthing Center in Lilongwe, Malawi. Please check our updates. Full report on the Clinic. Guatemala Project: Read the latest update (August 26th) about our continuing relief efforts. Please read the latest update about the joint ABC/LifeNets Guatemala Project. See blueprints of the new Malakia Clinic and the progress of the project. Can you help with BLANKETS and linens for our Malawi Project? We're Committed! LifeNets and Gladstone and Alice Chonde start construction of the new Malakia Clinic in Lilongwe, Malawi. There are several ways that you can help! We also will be shipping another container with equipment, food and supplies within 6 months. For more than a year now we've been helping UKRAINE with a MICRO-LOAN bank established by LifeNets. Read about how so much can be with so little and how it helps people feel better about themselves. Wheelchair Race to Benefit LifeNets in the Circle in Indianapolis Monday, May 1. Please read Media Alert! Also read about wheelchair project. LifeNets starts working in CHINA. Read about our trip to China from March 23-30. Thank you letter from Helle Rooma in Estonia for our donation to the Emajõe Kool Project. Thank you letter from Gladstone Chonde in Malawi for recently received medicine from LifeNets. The Wheelchair Project. John Doublestein (16), junior at Lawrence North High School in Indianapolis, wrote to Indiana First Lady Mrs. Judy O'Bannon proposing a plan to organize a system to collect and encourage the donation of wheelchairs in the Indianapolis community for use by needy people overseas. The First Lady's Office contacted LifeNets to help John realize his goal. LifeNets ships $56,292 worth of medicine to Ukraine and $2,348 to Malawi. 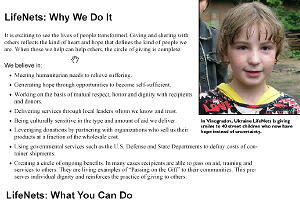 The rest of the story about Mission Ukraine 99 in Khust, Transcarpathia where we served thousands of citizens. Pictured are people wanting to come inside Mission Nazareth for optometric and dental help. In Malawi, we launch drive to help construct BIRTHING CENTER as part of Malakia Clinic that we have been helping for the past three years. Introducing the Chornobyl research of Professor Yury I. Sayenko, Dr. Sc. (Economics) Deputy Director, Institute of Sociology of Ukraine. Teddi Treybig Lends a Hand to Our Work in Chernobyl. Report, tribute and thanks! Year-end Appeal by LifeNets, a non-profit relief organization. Please consider helping -- your tax-exempt gift will be multiplied many times over!